Ron Rutherford is a man whose life has been built around music. He fondly recalls bouncing on the back seat of his Father’s Chevy Bel Air to The Beatles singing “I Want To Hold Your Hand” on the radio. “It was a typically beautiful Dallas, Texas day,” he says, “blue skies and fair weather cumulus clouds out the windshield as we sped down the highway.” It proved to be a seminal ride. He has been inspired by and passionate about music ever since. Ron played piano as a kid in Texas. Moving to New York City as a young man, he took up guitar. While living in New York, he played and sang around Manhattan and the Northeast; did some television and jingle work; was written up in the New York Times for his performances with The Rutherford & Steward Band; and wrote and performed briefly with legendary rock pianist Nicky Hopkins. 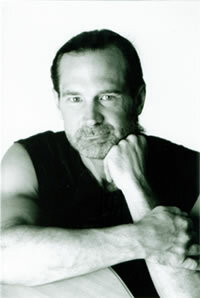 Ron Rutherford’s musical influences are eclectic and diverse including such artists as: The Eagles, Don Henley, Crosby Stills Nash & Young, Neil Young, Jackson Browne, Bob Seger & The Silver Bullet Band, The Steve Miller Band, Van Morrison, Buddy Holly, The Everly Brothers, The Beatles, The Byrds, Buffalo Springfield, The Band, The Allman Brothers, Creedence, Little Feat, Tom Petty & The Heartbreakers, Elvis Costello, Traffic, Leon Russell, Bryan Adams, John Mellencamp, Rodney Crowell, Warren Zevon and Hank Williams. Although growing up listening to and loving Rock and Roll on the radio and records, he had country music in his ears wherever he went, just from living in Texas – and both had a profound impact on him. Ron Rutherford’s music is something familiar you’ve never heard before – stories of love, loss, insight, and inspiration. Picture a full moon over a long lost trail and a lone wolf that beckons the listener to follow to the end. Ron Rutherford’s album, Lone Wolf, ends too soon.